Recently, I was contacted by Ty Taylor, co developer for "The Bridge" asking if I would be interested in checking out the game before it was released to consoles. Sadly, I had not heard of the game so I did a quick search on what it was and was delighted to see the words "logic puzzle" and "M. C. Escher" all in one sentence. Being a fan of said artwork, I told Ty I would be happy to check things out and he responded with a download code and some other press related information. Right from the beginning of the game I was given a simple challenge, most likely because I am an idiot, and couldn't figure out which way to go because I decided to walk left instead of right and I just kept looping the same screen over and over again. Good from a developers point of view, bad for me because it took my 8 year old to tell me to go the other direction and it all made sense. When you start the game, you are presented with a beautifully designed environment in which the look personifies what one would think M. C. Escher would create using a pad of paper and pencil. Coming to you in a black and white color palette, you move about the world as a human you had to wake up and walk him towards his house. The house is the place in which you get a basic tutorial on how to environment works and what it is you will need to do to go from one level to the next. Controls are very simple in that you will rotate the screen around left or right emphasizing the laws of physics to move objects around the level or world you are in. On the Xbox One, this was done by using the trigger buttons. In one level for instance, you will need to unlock a door with two keys, but in order to do so you need to rotate the world around left or right to slide the keys around a series of slides so that they can reach the door to be unlocked. Once that is done, you can open the door and proceed to the next level. The Bridge was designed and created as a project for Ty Taylor's Master of Science Degree in CS as well as an Art Minor capstone project for Mario Castañada. Once their projects were completed for their assignments, they decided to make it full scale production quality and deliver to the mass market. The primary features of The Bridge contain 48 total levels in which, as we are told by Ty took roughly 2 years to create as he hand drew out a ton of them, then threw out the cruddy ones. Gravity is manipulated, as we said before, by rotating the world around you, as well as some interactive abilities of dealing with gravitational vortexes and parallel dimensions. A time backtracking system will help you finish levels by allowing you to reverse the inevitable mistakes you will make so you can recover from a certain spot and try again. While we have not finished the game yet, we are told that once completed, there is another alternate version of the game to play that will also give you a different game ending as well. When you visit the main website for the game, it is quite obvious I am not alone in praising the design and implementation of The Bridge. It has basically received a metric ton of awards starting way back in 2011. The game is worth the download to play and take a nice breather from the fast paced action of your FPS or popular MMO of choice. 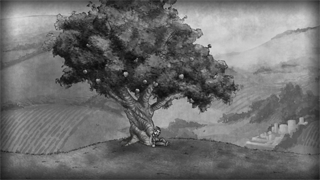 Besides, when you open up the game, knock your games character awake with the dropping of the Sir Isaac Newton apple on their head, you will also be putting a little bit of cash into the pockets of two guys who made a really great game.